Doran K Boston of Casper, Wyoming passed away Saturday November 3rd leaving behind so many people touched by his ready humor and caring nature. A memorial service will be held at 1:00pm, November 8, 2018 at Newcomer Casper Chapel. Doran’s wife, Nancy and their son, Kirt (Carolyn) and daughter, Blythe (Mike) will all miss Doran’s constant love, guidance, and friendship. His grandchildren Mariah (Kelly), Matt (Gracee), Jarydd (Angela), Mikaela, and Liam; sister, Anna Mae; brother, James; and four great-grandchildren, will miss his smiles, stories, and the many smart remarks he shared to let us all know how much he cared. Doran showed many how to achieve their dreams. He convinced Nancy’s reluctant parents to let a tough kid from the wrong side of town marry their only child. He spent 62 years with the love of his life Nancy. 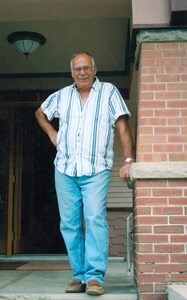 He completed a degree in Civil Engineering at the University of Wyoming and spent time in Texas and Colorado building a professional reputation. Upon returning to Casper he spent years providing leadership at Worthington, Lenhart, & Associates before retiring as President. Many knew Doran best in his lifelong professed dream role as a successful rancher. He and Nancy operated their ranch on Muddy Mountain and west of Casper until they chose to retire from the range for health reasons, though Doran was, and always will be, a cowboy at heart. Doran unselfishly shared himself through thoughtful advice, caring insight, and a willingness to dive in and help anyone in any challenge. His passing leaves all those he touched wondering where they will turn for that calm advisor and friend they leaned on so much. The family asks you to keep them in your thoughts. In lieu of flowers, please direct any donations or memorials to the gallery Doran and Nancy helped establish, ART321- Casper Artists’ Guild, or the Casper Humane Society. Add your memories to the guest book of Doran Boston. Doran, wish you happy trails, enjoyed working with over the years. You were a fair and honest man and a friend. I will miss you. On behalf of my husband, Ray Wulf, please accept our sympathy at the passing of Doran. Ray has had the opportunity throughout his heavy highway construction career to often work and even socialize with Doran, and he has always had positive things to say about Doran, a man for whom Ray's respect is second to none. Ray believes and has said of Doran that he is the nation's best engineer, and Ray is not known for complimenting engineers! Please accept our sympathy at the loss of a well-respected and by his obit a well-loved husband, father, friend and businessman. The staff of Wyoming Public Media send condolences in the death of Doran Boston. We know he will be missed by many. His support of WPR is always appreciated. Nancy and family, please accept sincere condolences for your loss. I cherish memories of the times we were able to share. Doran was not only a wonderful client, but also a friend. You all were so fortunate to have this handsome, loving cowboy in your lives. May he Rest In Peace. Prayers for all of you he left behind. Dear Nancy-Our heartfelt sympathy to you and your family. Doran was a wonderful man and will be missed. Uncle Doran was my hero and play mate from childhood through my entire life will miss him greatly ????????? ?